Sally Hansen's Wax Strip Kit for face, brows and bikini, consisting of 17 double-sided, cold wax strips (to give 34 strips in all) are easy to use and are simply warmed in the hand prior to use. No fuss or mess so can be used anywhere. Inexpensive, at between $4 - $5 dollars for a pack, which also includes a bottle of Azulene oil for post treatment use. All in all a pretty positive review. 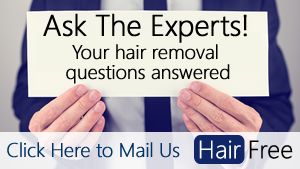 Why Choose Waxing for Hair Removal? Sally Hansen products are manufactured in the USA, and are a Brand of Coty Inc. The wax strip kit for face, brows and bikini is just one in the range and there is also a similar kit available for underarms, legs and body. The wax is sandwiched between 2 clear plastic backing sheets which are peeled carefully apart to give 2 ready to use strips. The product is very easy to use, with no mess or hassle, and currently retails from about $4 for the pack of 34 including azulene finishing oil, so pretty inexpensive for what you get. As previously mentioned, there are 3 sizes of strip; small, medium and large. The instructions merely say that you should use the appropriate size for the area being treated. I worked on the assumption that the smallest one's are most appropriate for the brows or upper lip, the medium for other areas of the face e.g. chin and the large for the bikini line. There are 9 double-sided small strips (18 in all), each measuring approx. 17mm x 50mm. There are 6 double-sided medium strips (12 in all), each measuring approx. 30mm x 50mm, a good size for removing chin hair. There are 2 double-sided large strips (4 in all), each measuring approx. 30mm x 100mm​. The kit includes a 0.5 fl oz (14.7ml) bottle of azulene oil for use post-treatment to remove any remaining traces of wax, soothe and moisturize the skin. Below is shown a list of ingredients for both the wax strips and finishing oil to check in case of any known allergies. Just to be sure, you should carry out a patch test 24 hours prior to using the product, in order to test your skin for adverse reactions. Do this by using the product, following instructions, on an area such as the inside of the elbow. Do not use on compromised skin. You should seek medical advice prior to use if you suffer from any skin-related disorder, diabetes or circulatory issues or if you are receiving any dermatological treatment. Additionally, you should not use this treatment immediately after a hot bath or shower. For best results you should wait approximately 3 weeks after you have shaved or treated the area with other hair removal methods prior to using these strips. Personally, I found this product to work pretty well for my fine, light hair. Generally, reviews for this product seem to be a bit mixed, as they are with most waxing products,​ but for the price, it is certainly worth giving them a try. ​I actually tested the larger wax strips on my legs, and found that they worked pretty well, although the hair did need to be long enough, as the shorter hairs were not removed - the manufacturer recommends at least 1/4"growth. One of the advantages of waxing is that it is pretty easy to do at home, providing the area you wish to wax is reachable, and therefore so much cheaper than visiting a salon. Of course, being able to carry out the treatment in the comfort of your own home and at your own convenience is an attraction for many people, coupled with the privacy aspect - not needing to "bare all" to anyone. The results of waxing last longer than shaving or using depilatory creams (anything from 1 - 6 weeks, depending on the area) as the hair is pulled out at the root. Waxing also produces lighter and sparser regrowth with regular use, and over time​ the pain becomes less of an issue as your skin's tolerance increases. We have published separate articles with tips to minimise pain while waxing and best products to relieve pain while waxing. ​It is quicker than using an epilator - with quite large areas being cleared with one zip! Do you have to heat the product up? Can you use on underarm hair? There is no reason why not, but ​Sally Hansen do produce a separate product specifically for und﻿﻿﻿erarms, legs and body with suitable sized strips included. How long does hair have to be for this to be effective? For best results hair should be at least 1/4" long - it is advisable to let hair grow out for approx. 21 days following shaving etc. before using this product. Is it easy to use - for first timers? Yes, this is a very easy product to use, although perhaps not for first time eyebrow shaping. It is advisable to go to a professional to have eyebrows shaped for the first time, and thereafter it is much easier to keep them tidy using wax strips and tweezers​. I have come to the conclusion that this product can definitely be effective if, like me, you have fine, light hair. If, however, your hair is thicker and coarser you may need to use more of the strips to achieve the desired results. Method is important, making sure to soften the wax with your hands prior to use, and zipping off the strip in the opposite direction to hair growth, as is making sure that hair length is sufficient (at least 1/4"). ​All this said, I like the product for its simplicity of use and for the price, I would recommend giving it a try. Quick and Easy - simply warm between hands and use!